Another key was a less-than-speedy scramble by Wisconsin quarterback Darrell Bevell. It came after the Badgers had recovered a UCLA fumble at the Bruins 34. At the UCLA 21, Bevell dropped back to pass, the protection collapsed, and the 23-year-old sophomore ambled into the left corner of the end zone. His longest run of the season had covered only 9 yards, but this jaunt put the Badgers ahead 21-10 with 11 minutes to play. 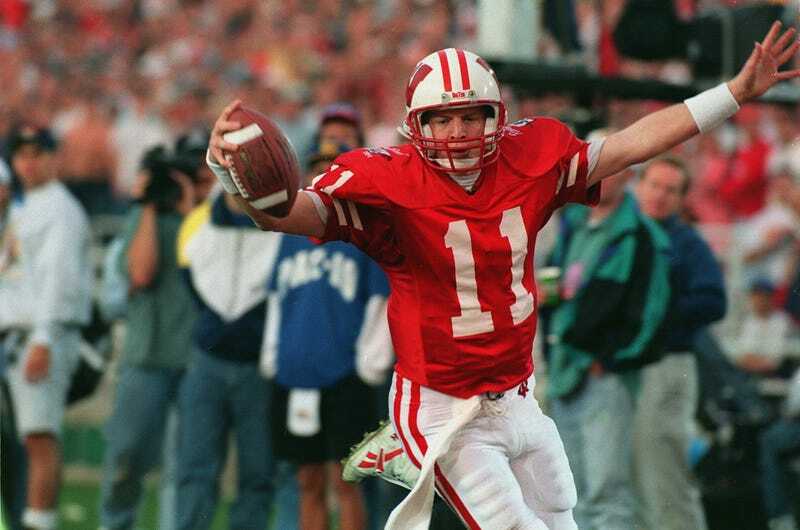 "I'm sure the coaches up in the press box were laughing, and my teammates on the sidelines were laughing, because they all think I'm so slow," Bevell said on the field as Wisconsin's Fifth Quarter celebration blared. "But I got to the end zone." Bevell was a miserable, plodding scrambler with one great, meaningful scramble. As an NFL coordinator in Minnesota and now Seattle, he's spent his career trying to find quarterbacks who excel in the area where he was weakest. When Bevell was with the Vikings, the team drafted Tarvaris Jackson and Joe Webb. Bevell then acquired Jackson again when he moved to Seattle, inflicting the perpetual project QB on another fan base. As a consequence of Bevell's bad taste in quarterbacks, his teams have struggled to find the end zone. His Vikings units ranked, by points, 26th, 15th, 12th, second (behind the non-Bevell-friendly Brett Favre), and 29th again, and last year's Seahawks ranked 23rd, which is exactly where they'd been prior to Bevell's arrival. After last season's failed Tarvaris experiment, the Seahawks did what they were supposed to do: They signed Matt Flynn, the kind of quarterback that doesn't make Darrell Bevell drool. Seattle paid him $10 million guaranteed—starter money. He would grow and lead them somewhere. For whatever reason, the Seahawks decided to add one more quarterback of the future, drafting Russell Wilson out of Wisconsin in the third round. Perhaps they wanted to humor Bevell (who attended Wilson's pro day, at his alma mater) by letting him grab another one of his typical projects. This one had even stronger odds against him than Jackson and Webb—he was 5-foot-11. The conventional wisdom about quarterbacks and height stuck him nearly 70 picks behind Ryan Tannehill and 50 picks behind old man Brandon Weeden. An even bigger insult came when Arizona State's Brock Osweiler, whose only skill is height, went in the second round. But the Seahawks, Bevell, and the rest of the NFL have spent the 2012 season finding out that Wilson brings something altogether different from Tarvaris Jackson and the rest. He's just as good an athlete, but he's far more capable of bringing his athletic abilities to bear on the outcome of games. Unlike the rest of Bevell's regulars, Wilson excels when scrambling. As Field Gulls has pointed out, out-of-the-pocket Wilson throws like a second baseman charging a ball and whipping it across the diamond. He pivots forcefully and jumps a little and flings the ball out, and his throws seem, surprisingly, more comfortable this way. The stats are a few weeks old, but Mike Sando reported that Wilson's QBR is better than the in-the-pocket league average when he's in the pocket, but substantially better than the outside-the-pocket league average when he's outside the pocket. When he scrambles and makes people miss, his passes don't suffer for it. Outside influences have made the Bevell-Wilson combination work even better. On Sunday night, and on the Sunday prior, the Seahawks ran plays out of the pistol formation, which the Niners, Redskins, and Bills all displayed before Seattle did (and which was invented by Colin Kaepernick's college coach, Chris Ault). The Seahawks have also used Wilson, with great success, in the zone read option, where the quarterback makes a decision to keep the ball or hand it off based on defensive linemen's initial movements. It had rarely popped up in the NFL until Rob Chudzinski and Cam Newton shredded the league with it last year. Now Wilson is its master practitioner, and Bevell calls it often. Bevell's foreign playbook wrinkles have played a major part in Seattle's recent offensive awakening. Wilson opened the season as an infrequent, so-so runner; he's averaging nearly 50 rushing yards per game since Seattle's bye. His arm is getting better, too: Since October ended, Wilson's only had one start with a passer rating below 100, and his team won that game 58-0. The Seahawks' offense now ranks eighth in the league in points. This wasn't how Darrell Bevell drew it up, but the ex-Wisconsin quarterback finally got his man.